With efficient support of our professionals, we have been able to offer an exquisite collection of Horse Textile Goods. These professionals manufacture the complete range making use of finest grade fabric, which is sourced from reputed vendors of the market. Designed as per the changing trends of the market and incorporating client’s specifications, these are widely appreciated for their high comfort fitting, intact stitching, colorfastness and shrink resistance. 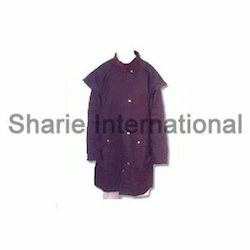 Horse Riding Jacket offered come in quality construction finish and feature oil skin jacket with baseball and can be made available in sizes of X Small, Small, Medium, Large, X Large. With color options of Black, Brown; these riding jackets are particularly suitable for use in low temperatures and horses need to stay warm around barn areas. Some of its features include heavy waterproof riding jackets; provides for warm, dry and comfortable usage experience; different material options like cotton, nylon, polyester, wool and others; choice of different colors like Black, Blue, Brown, Green, Grey and others. 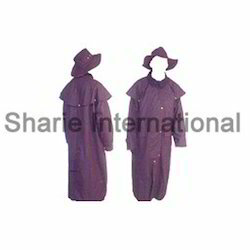 Horse Riding Coat offered comprise oil skin long coat with head and is made available in size options of X Small, Small, Medium, Large, X Large. With color choices of black & brown, these riding coats also exhibit distinctive markings as per the specifications provided by the customers. Some of its features include superior construction finish; provides for warm comfortable usage experience; water proof/water-resistant finish; available in different size and color options. 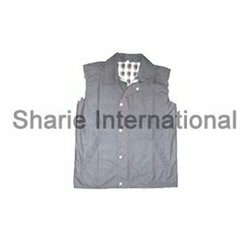 Three Quarter Jacket offeredcome in quality construction finish and feature oil skin quarter jacket (3/4) in size options of X Small, Small, Medium, Large, X Large. Made available in black and brown color options, these jackets find suitability for horse shows jackets for children, women, men. Some of its features include available in an array of colors, designs and texture options; different finish choices for suiting individual styles; durable construction finish; choice of customization. Horse Riding Vest offeredfeature oil skin vest coats that come with cotton wool lining and can be made available in size options of Small, Medium, Large, X large. Made available in black and brown colors, these quality finished riding vests provide for protective riding support and allows for comfortable usage support through all levels of competition including different horse riding disciplines. Some of its features include provide for superior shock/impact absorption; provide for optimum mobility while riding horses; available in different color and size options. Looking for Horse Textile Goods ?